The 2013 edition of Under The Sun featuring Smash Mouth, Sugar Ray, Gin Blossoms, Vertical Horizon and Fastball played to an appreciative crowd at CMAC Saturday evening. Under The Sun’s origin takes us back to 2012 when Sugar Ray’s Mark McGrath and Everclear’s Art Alexakis teamed up to bring you the similar summer tour last year entitled Summerland. However the two had a little disagreement about the direction of the tour which led to each doing their own tours this summer. McGrath said his plans were to make Under The Sun an annual tour. 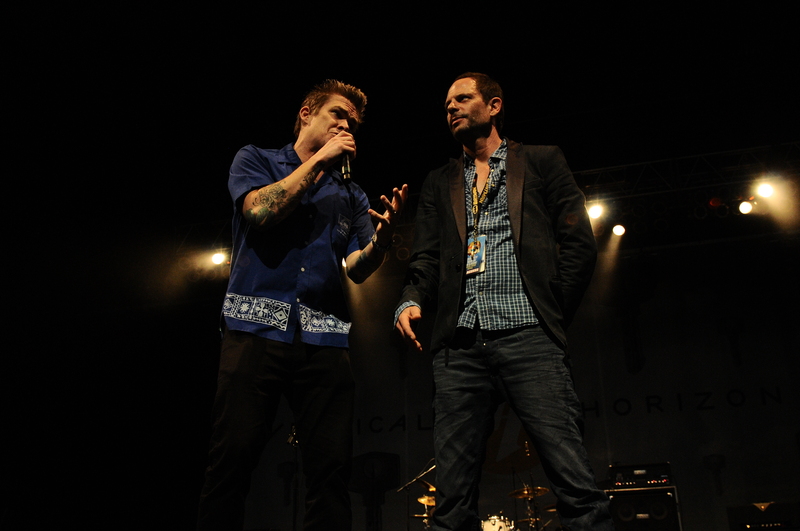 Similar to last year, McGrath came out to introduce the bands and brought Gin Blossoms singer Robin Wilson up with him to do so. They first introduced Fastball, the band from Austin Texas who opened the show. When fastball went on to start the night it was raining, but it soon subsided . The band first hit big in 1998 with their All The Pain Money Can Buy release which included their smash hit “The Way”. The band played a short set that was able to give everyone a little taste what they were all about. Vertical Horizon was up next and played a splendid set that featured some of their best known songs including “You’re A God” and Best I Ever Had (Grey Sky Morning). It wasn’t until the band ended their set with “Everything You Want”, which incidentally was the first song the crowd came noticeably alive for of the evening. A huge banner with the Gin Blossoms logo was sprawled across the stage signifying Wilson and Company were up next. The Gin Blossoms also appeared on last year’s Summerland with Sugar Ray, making them the only two returning acts. Singer Wilson mentioned how it was a privilege to be able to play for the audience and his performance showed it. He invited everyone to get up close to the stage causing chaos for a few minutes as venue security and police tried to prevent things from getting out of hand. The band played their usual arsenal of hits including “Til I Hear It From You”, “Hey Jealousy” and “Follow You Down” all standouts from their catalog. One thing I noticed about the band is how they simply go out, play their songs in businesslike fashion and leave. Nothing flashy, but at the same time winning over fans new and old who either forgot about them or maybe are just seeing the band for the first time. McGrath and his band Sugar Ray were up next. One thing that can be said about McGrath is he is not only a musician but a full fledged entertainer. He can work a crowd over with the best of them. Sugar Ray played a short set that featured their biggest hits, “Fly”, “Someday” and “Every Morning”. The song that probably got the best reaction however was “Answer The Phone” an underrated song that never received its just due. Their all too brief set was one of the few injustices of the night. Closing out the show was Steve Harwell and his band Smash Mouth. Along with Harwell, bassist Paul De Lisle and keyboardist Michael Klooster have been around sinc ethe band’s debut Fush Yu Mang. Joining them were drummer Randy Cooke and guitarist Sean Hurwitz. Kicking off things with “Can’t Get Enough Of You Baby”, the band played a mixed set that included a pair of covers in The Kinks “You Really Got Me” and The Monkees “I’m A Believer”. The band closed out their brief set with smash hit “All Star” as the night came to a close. I for one can’t wait until next year’s lineup. A few suggestions to Mr.McGrath on my end would include Letters To Cleo, Urge Overkill and close it out with Soul Asylum. That would be a lineup to see for sure. Special thanks to the fine folks at Dixon Schwabl for all their help!